Math Dice is a game by Sam Ritchie, published by ThinkFun. It is for 1 or more players. In this game, players will be rolling dice, adding, subtracting, multiplying and dividing their way to victory. The player that can do this the best and the fastest will be declared the winner. To begin, get out the 12 sided dice and the 6 sided dice and place them on the table. That’s all there is to it. Play now begins. One player starts off by rolling the two 12 sided Target dice. The 2 numbers rolled are then multiplied together. This is the Target number that players will be trying to acheive. The three 6 sided Scoring dice are then rolled. These are the numbers that the players will be using to calculate the closest number possible to the Target number by creating an equation using the 3 scoring numbers. It should be noted that each scoring number is only able to be used once in each equation. The players are able to use any combination of mathmatical operations to create the number. They can use addition, subtraction, multiplication, division, powers and roots. Once a player has an answer, they can simply call it out. The first person to call out an answer, claims that number. As long as the Target number has not been reached, the other players have 15 seconds to respond with a new answer that is closer to the Target number. This continues with players calling out answers and then having 15 seconds to respond with a closer number until one player hits the Target number exactly or the time limit of 15 seconds has been reached without a response. If the Target number is hit, the player that hit the number wins the point. If the time limit is reached, then the player that came up with the closest number must state their equation that gave them the number. If they are correct, then they win the point. If they are wrong, then the next closest answer is allowed to state their equation. If they are correct, then they win the point instead. The game continues until a player wins 4 points. The first player to do this is the winner. This game comes with a handful of dice, a rulebook and a small bag to hold it all in. First off there are the two 12 sided Target dice. These are your normal white polyhedron dice with engraved numbers. The 3 six sided Scoring dice are blue instead of white and they have pips instead of numbers on them, like most regular six sided dice do. The rulebook I’ll cover in the next section. The bag is small, like the size of a shirt pocket, but it has a really cool looking logo on the front and a nice plastic spring clasp drawstring cord lock. It appears to be made of neoprene or some type of nylon like material. Everything fits neatly inside the bag without any problems. For what it is, I think it looks pretty darn cool. I really like the bag. As a matter of fact, I wish I had a bunch more of these for some of my other games. I think the bag is just the right size to hold tokens or other small gaming materials, instead of the normal ziplock style bags that they usually include in the box. Anyway, the game is small enough that it can be placed in your pocket inside the little bag and carried anywhere. Overall, it’s not bad at all. The rulebook for this game is rather small and fits easily inside the drawstring bag that is included with the game. It’s 20 pages long and all in black and white, no color anywhere to be seen. There are only 2 or 3 pictures in the book, which is a bit disappointing. However, it’s not like the game really needs a ton of pictures to explain it with. The rules are simple and easy enough to follow. There’s nothing here that should give anyone any problems. The rulebook includes a few variants to make the game a bit simpler, for younger players. Such as only using one 12 sided Target die instead of two, or using both 12 sided dice but adding the numbers instead of multiplying them. There are also rules that allow for cooperation instead of competition, such as allowing a pencil and paper or a calculator, dropping the 15 second time resrictions, or awarding everyone that can match the best answer for that turn a point. Another addition to the rulebook is a set of 8 Practice Tables to help players discover different patterns and equations through various ways. These are a big help and are kind of fun to see all the different things that the numbers can do. They are a great help and should encourage some creative thought after looking over them. Overall, the rules are explained quite well. I think that the book isn’t bad, even though I would have preferred a little color and a few more pictures inside it. I don’t know many kids that like math, including mine. My kids absolutely hate it. My son hates it more than my daughter does. She’s 8 though and hasn’t gotten to the more complexities of algebra and geometry like my son has. Still, it’s not her favorite subject either. As for me, I hated math when I was in school too. Just looking at a math problem filled me with dread. It wasn’t till I got into college that I started appreciating all that math could do for me. Needless to say, I’d never have realized that I’d be working with math on a daily basis in my accounting job. As a home schooling family, I’m usually the one that deals with all the math related problems for the kid’s school work. I spend a good part of my evening going over problems and equations, helping my son learn all the complexities of Algebra and Geometry. Mrs. Gravitt would be so proud of me. You may be asking yourself, what does all that have to do with Math Dice? Well if you could find a way to make math fun for your kids, wouldn’t you use it? That’s what Math Dice is. It’s a neat, simple and fun game that can be played with your kids to help them with their math skills. It only takes about 10 minutes to play, so it doesn’t take up a lot of time. As I mentioned earlier, the game is small and light weight, fitting easily inside your pocket so that it can be taken anywhere. You’re on a field trip, waiting on your lunch order. Break out the Math Dice and play a round or two while you wait. The kids are tired of going over their multiplication tables. Break out the Math Dice and see what they’ve learned in a fun way. The possibilities are endless. The game can even be practiced solo, by simply rolling the dice and see how quickly you can come up with the Target number. I realize that as an educational game, it’s not going to appeal to everyone. For teachers and home school parents, this is a big help and a great addition to your teaching materials. The kids like it and it helps them to learn. What better to learn then math? It’s something that you will use every day. This game sharpens those math skills and makes it kind of fun too. I highly recommend this as a teaching resource, especially for home schoolers. 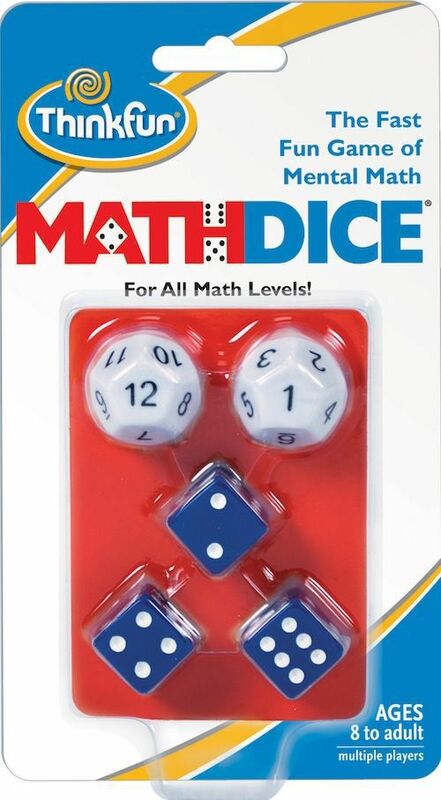 Math Dice is an educational game to help improve math skills. It’s really fast and simple. Most game sessions last around 10 minutes. It’s a small, light weight and portable game that can be easily carried around in your pocket. It can easily be adapted to every players mathematical abilities making it fun for everyone. This is one that the whole family can play, from the kids to the grandparents. The variants allow the game to be played with even younger players that might not have the math skills that adults or older kids should have. It’s fast and fun and a great resource for teachers and home schoolers. This is one that I would highly recommend for helping to improve your kid’s math skills. You should definitely pick up a copy. 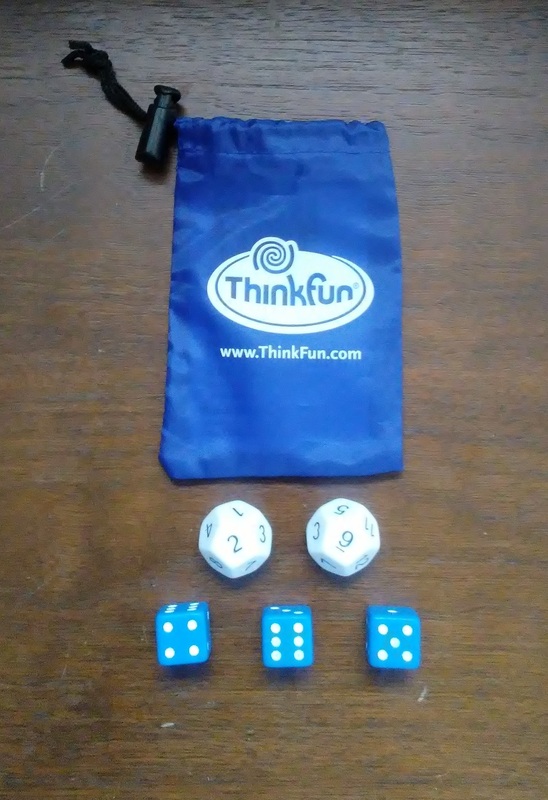 For more information about this and other games, please check out ThinkFun at their site. This entry was posted in Reviews and tagged board, board games, card, card games, dice, dice games, eductional, fun, games, math, math dice, ritchie, sam, sam ritchie, think, thinkfun. Bookmark the permalink.